Moraine Valley Community College will present “American Griot,” an original play exploring Muslim influence on the American music genre known as the blues. The Academic Theater production will run Feb. 21 to March 3, in the John and Angeline Oremus Theater, inside the Fine and Performing Arts Center, 9000 W. College Parkway, Palos Hills. Show times are Thursday through Saturday at 7:30 p.m., and Sunday at 3 p.m. Tickets are $15, $12 for seniors, and $10 for students with ID and children ages 12 and under. The play is written by local residents Ronnie Malley, a professional playwright and former Moraine Valley student, and Reginald Edmund, local professional playwright. Directed by Dr. Craig Rosen, Theater professor, and Academic Theater coordinator, the bulk of the roles will be played by Moraine Valley students. Performers include Yasir Muhammad, of Oak Lawn; Jarrin Comer, of Matteson; Curtis Griffin, of Hazel Crest; Angelo Greene, of Blue Island; Kirsten Baity, of Robbins; Andrew Kuntz, of Alsip, Joshua Unruh, of Oak Lawn; Destiny Patino, of Merrionette Park; Bryanna Hedrick, of Chicago; and Stephanie Reusz, of Tinley Park. Told through the lens of Mamadou, an 18th century griot (African storyteller musician), the play takes audiences on a musical journey to the crossroads of Africa and America, revealing the shared history of Islam and the blues on both continents. A grant to help fund the creation of an original theatrical performance was awarded to the college through the National Endowment for the Arts (NEA). Art Works is the NEA’s largest funding category and supports projects that focus on the creation of art that meets the highest standards of excellence, public engagement with diverse and excellent art, lifelong learning in the arts, and strengthening of communities through the art. 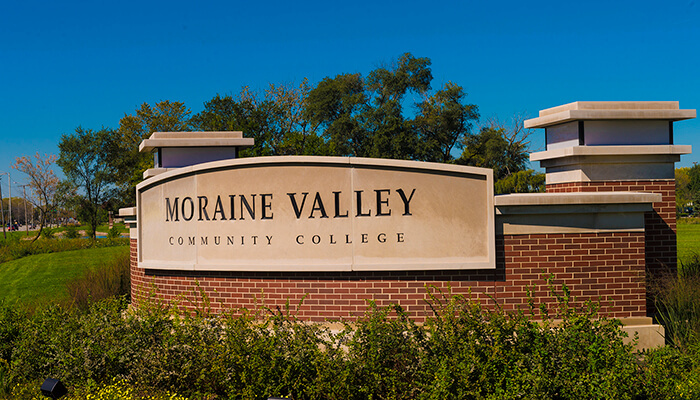 The college worked in collaboration with the award-winning Silk Road Rising, a Chicago-based theater company to create the performance as part of Moraine Valley’s Academic Theater Program. Creating the original theater work is a continuation of the Mosaics: Muslim Voices in America program at Moraine Valley, made possible in part by a grant from the Association of Professional Arts Professions’ Building Bridges: Arts Culture and Identity, a component of the Doris Duke Charitable Foundation and the Doris Duke Foundation for Islamic Art. THIS POST HAS BEEN READ 13936 TIMES SO FAR. THANK YOU!